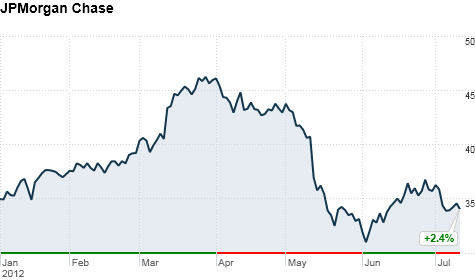 JPMorgan Chase's stock has rebounded somewhat since the bank announced trading losses on May 10. NEW YORK (CNNMoney) -- JPMorgan said Friday that the loss from the bank's chief investment office's errant trades has totaled $5.8 billion so far this year. The three managers who led the trading division no longer work at the bank and could lose as much as two years of income, according to JPMorgan. All the traders involved with the so-called London Whale losses have also been "separated" from the bank, without any severance. JPMorgan CEO Jamie Dimon praised Ina Drew, who led the CIO office, and said she volunteered to give up two years' worth of pay, the maximum amount available for clawbacks. Drew retired from the firm shortly after the bad trades came to light. When the losses were first revealed on May 10, CEO Jamie Dimon pegged them at around $2 billion but said they could move higher. JPMorgan said Friday that the losses totaled $4.4 billion in the second quarter and Dimon said the most the firm could still lose is $1.7 billion. But he also noted that "it doesn't have to lose money at all." Dimon said the CIO would no longer trade derivatives, which were behind the big loss. Instead the investment bank will be unwinding the original trades. He said the firm has already reduced its position in an obscure index known as IG-9, where the CIO's bets were made, by 70%. "What remains isn't that big of a deal," said Dimon. JPMorgan executive Michael Cavanaugh who oversaw the review of the London Whale defended how much Dimon and CFO Doug Braunstein knew about the potential losses back in April, when Dimon dismissed press reports of the London Whale as a "tempest in a teapot." Cavanaugh said Dimon, Braunstein and other senior executives were assured by CIO traders and managers that the total loss from derivatives bets ranged from a profit of $350 million to a loss of $250 million. JPMorgan said the firm has emails, voice tapes and other documents that suggest traders may have been hiding the losses. Bank executives said they're no longer confident in the figures reported by the CIO and that JPMorgan would be restating its first-quarter earnings. The restatement will reduce first-quarter net income by $459 million. "This has shaken our company to the core," Dimon told analysts. By the numbers: JPMorgan reported an 8.7% decline in net income to $5 billion, or $1.21 per share, on $23 billion of revenue during the quarter. Analysts had expected earnings per share of 72 cents and revenue of $22 billion. Commercial lending was a bright spot, increasing 24% year over year. But real estate lending dried up. JPMorgan's home equity loans and mortgage loans declined by more than $11 billion from the prior year's quarter. Slowing mergers and IPO activity pushed the company's investment banking profits and related fees down during the quarter. Investment banking fees dropped roughly 35% to $1.2 billion. Net revenue from investment banking fell 7% to $.6.8 billion. Dimon said JPMorgan (JPM, Fortune 500) hopes to restart buying back stock in the fourth quarter, if the Federal Reserve approves the bank's new capital plan. Shares of JPMorgan surged 4.6% in early trading. The bank has lost roughly $25 billion in market capitalization since JPMorgan first revealed the loss.